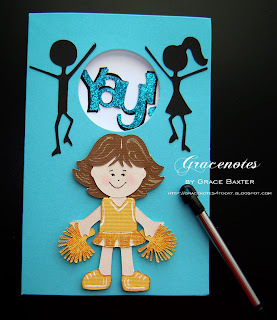 Grace Notes for Today: Yay! New Job Congrats! This is one of those personal achievements in life that needs to be recognized with a special card. What could be more important than landing a new job! I am the #1 cheerleader when it comes to people achieving success in life, especially if it's been a long grind for them. 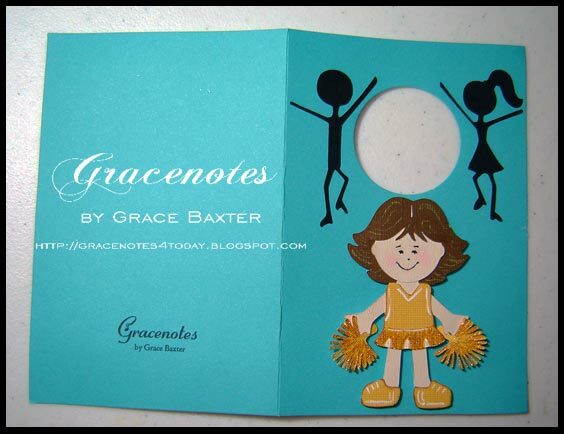 So when I discovered the cute little cheerleader on the Paper Dolls cartridge, I just had to use it. And for fun, I gave her a hairstyle similar to my own. Even added the golden highlights. What? You're surprised?! I am a creature of detail, remember. The card itself came with the hole already punched. The trick was to find a sentiment... the right sentiment that would fit the hole. Nothing worked so I created my own, using my Gypsy and the Alphalicious font. The boy and girl silhouettes are from Beyond Birthdays. The stylus in the above photo is a hint that the Gypsy helped create the card. 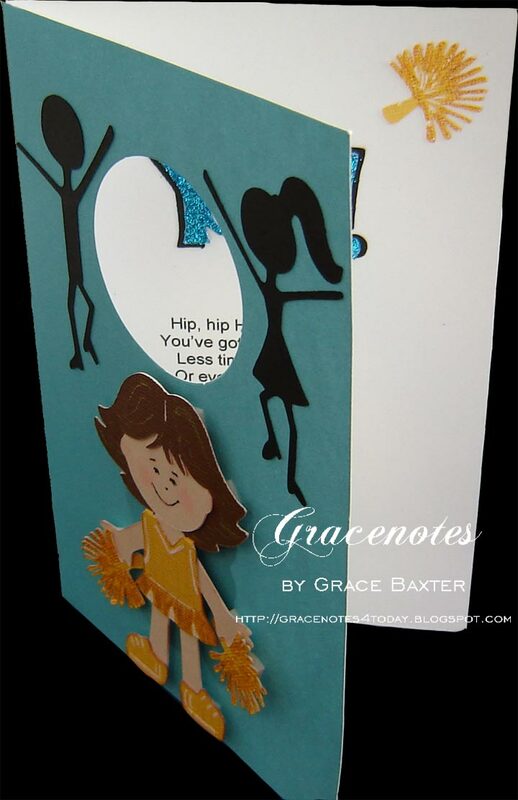 The cheerleader is attached to the card with dimensionals. I used thicker ones under the pom-poms, placing them so that they look like she is really holding them. Once adhered to the card, I fluffed the pom-poms this way and that. The pics don't clearly show the detail of the pom-poms. I used MS gold glitter pen to sparkle up the skirt and pom-poms. The cheerleader's dress has pleats so I highlighted them with white gel pen, and outlined other cut spots on her top and shoes, adding laces to the shoes. The inside took some fiddling around to get the poem (home made) and my logo (on the back) to fit just right. I ruined one card in the process. Have you ever done that? But I think it all came together nicely. I made a second set of pom-poms to emphasize the "YAY". I added turquoise glitter over the blue cuts. 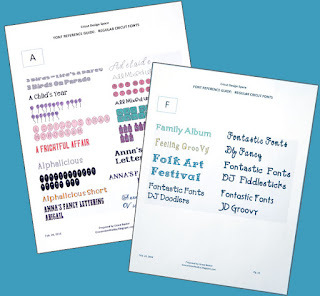 The "Congrats" phrase is shadowed in black and the aqua star layer is glittered to match the "Yay". Alphalicious - "Yay! 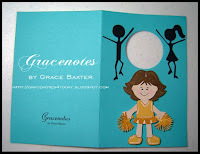 ", designed on Gypsy, size about 1.5"
Beyond Birthdays - Boy and girl silhouettes and Contrats, sized at 2.5"
Using a Q-tip, I gave the cheerleader rosy cheeks, eyes, mouth and shading around body, shoes and outfit. I love this card. All your details are great. I'm your newest follower.